Stapleton-Spence relocation of its San Jose corporate offices to its fruit processing and copack facility in Gridley, CA will be final on March 31, 2013. 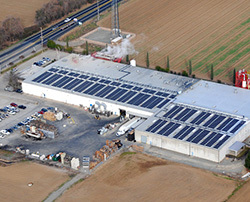 The Gridley plant is located at 1900 Highway 99, Gridley, CA 95948. The move stems from Stapleton-Spence growth as a copacker and will enable staff to have closer contact with its production facilities in Gridley. Stapleton’s processing and copack facility has been in Gridley, an area that embraces agri-business, for over a decade. “The move should be seamless to our vendors, customers, and associates as telephone numbers and extensions will remain the same,” says Brad Stapleton, President, Stapleton-Spence Packing Company. “The consolidation of our office will create a work environment that modernizes our internal communication, inspires our employees’ passion for our business, and assures efficiency and the highest level of customer service.” added Stapleton. Stapleton’s is committed to food safety from farm to table, strictly adhering to certified manufacturing and quality assurance processes. Food certifications include USDA, kosher, and organic. Stapleton’s processing plant is GFSI compliant, BRC Certified, and has a Gold Silliker Food Safety rating.